It has been awhile since I posted. I seem to have lost some momentum with this gratitude journey. I will let it happen when and how it needs to. I cannot make this a “forced” To Do item on a list of To Do items. If I made writing obligatory, it would be a betrayal to the values of my personal gratitude journey. A very important ingredient of gratitude is acceptance. I accept that I will walk this journey at a pace that is write right for me. So, today, without forethought of what the topic would be, I have accidentally arrived at acceptance. So be it. I suspect my personal experience is similar to many others. Acceptance comes easy when you apply it externally, but not so easy when you apply it internally. We all tend to be self critical. Considering the amount of time we spend with ourselves, all of it, that is quite tragic. Acceptance wears many faces and I would like to delve into what that means to me. I am grateful that I am accepting of diversity. I judge people solely on how they treat the world around them, including how they treat me. Their skin color, their gender, their race, their culture, their age, their physical ability, their sexual orientation, their socioeconomic status… are all completely irrelevant. Demographic labels should be limited to statistical analysis and not for ingraining practices grounded in bigotry, judgement, or fear mongering. When we can get by the labels we place on people, we start to see the people. 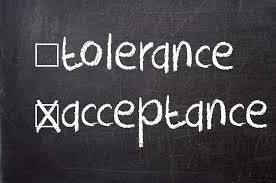 Another form of acceptance that is important to me centers around deciding what I will and will not accept into my life. I have not always had healthy boundaries. Without boundaries, we may allow others to treat us with disrespect. Without boundaries, we may experience an abuse of trust that leads to dysfunctional relationships with those around us. Patterned behaviours from our youth tend to doggedly follow us into adulthood. One of my greatest challenges is around forming boundaries, adhering to them, and accepting that its is not only my right, but my duty to myself to do so. When we allow abuse in our life, in whatever form it takes, we essentially are devaluing ourselves. When we do that, we can hardly be accepting of who we are. We are letting the world tell us who we are. I guess what I am trying to say, is that in order to be accepting of myself and my own foibles, I had to adjust the signal to noise ratio of my environment. In many cases that has involved disconnecting from the toxic behaviours of people in my life, and in some cases, disconnecting from the person altogether. My gratitude in this regard is that I know that I have the intestinal fortitude to make tough decisions with regards to my own boundaries. I have the capability of saying no, and that is quite empowering. I have made many tough decisions through the years, and those decisions have give me the foundation of self acceptance, self respect, and the knowledge that no matter what life offers, I am capable of steering my ship through the storm. Thinking about it, self-acceptance is a foundation block for self respect and self confidence. This entry was posted in Life's Lessons by Bixby. Bookmark the permalink.